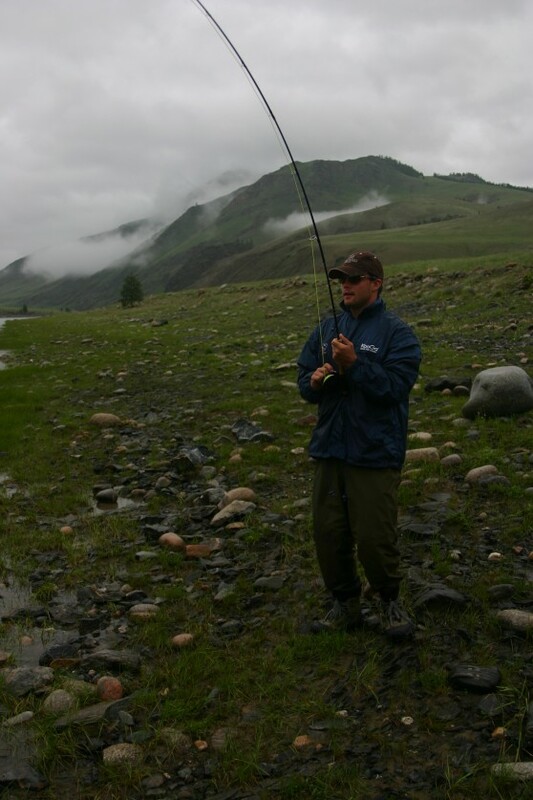 Mongolia has only recently become a hot destination for fly and spin fishermen a like thanks to pioneering companies such as Fish Mongolia. 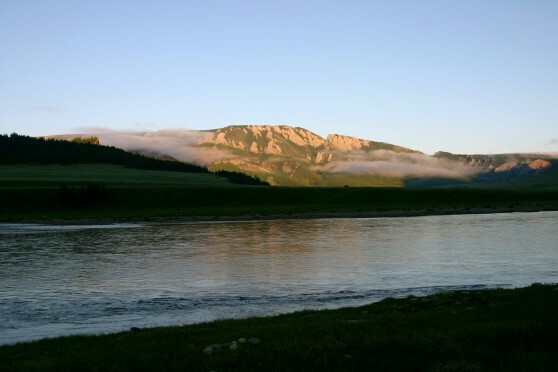 The 6-day float fishing trip gives you access to rarely fished, inaccessible waters. Floating an average of 10km a day allows you plenty of time to fish the best pools as you travel through the magnificent scenery of the Delger River canyon. The water is crystal clear with a gravel bottom which makes it easy to sight cast for the massive Taimen that inhabit these waters. 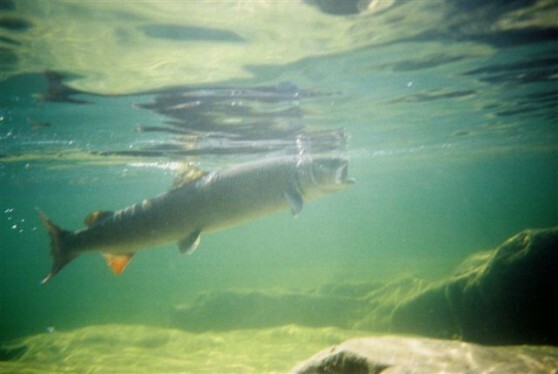 Taimen are the largest member of the salmon family with the average size around 28 - 30 inches long and 10 - 12 lbs. They are an aggressive fish that feed on anything that they can fit in their mouth - mainly gerbil's, mice and even small ducks which makes for spectacular fishing action. 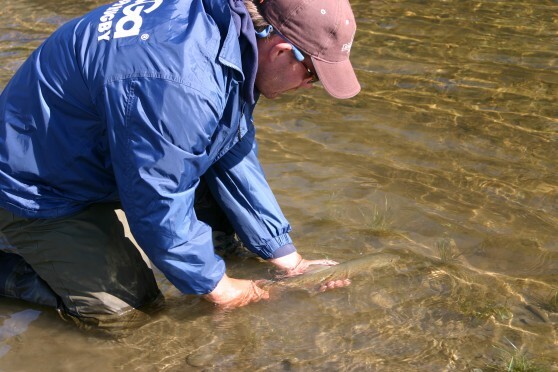 Not to be overlooked is the exquisite dry-fly fishing for Lenok Trout and Grayling. Lenok are the Mongolian equivalent of a trout, distantly related to Char, generally around 15 - 20 inches (2 to 3 lb) they can grow to over 30 inches. These trips are for adventurous anglers who enjoy comfortable camping, remote travel and exciting fishing in beautiful locations. "Andy promised us a wild river that almost no one knew about and he delivered. 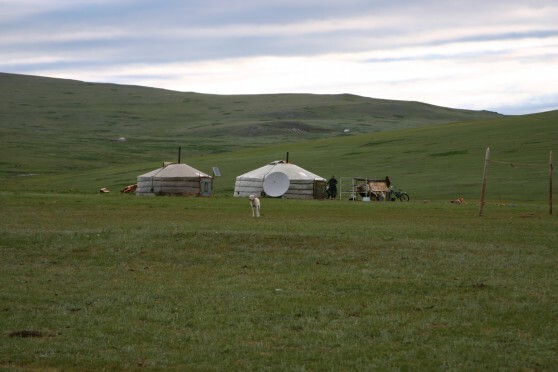 From the airport in Muron, we bumped our way over the grassy Mongolian Steppe past nomad tents and herds. At first I thought, "No way is there a big river hidden out here!" But we snuck on a trackless route over a few hills and down a steep valley into a hidden canyon where a beautiful river stretched out before us." 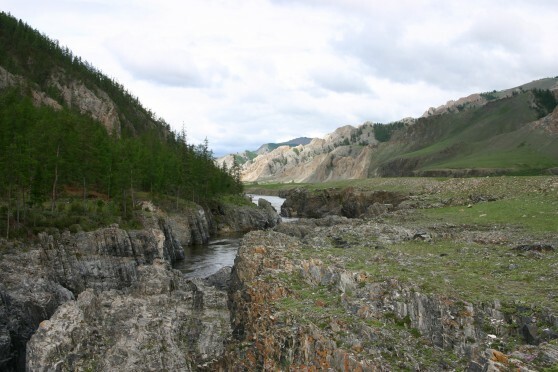 "The Delger-Muron River Valley is absolutely stunning - a wide river alternating between rapids and deep pools, a wildflower laced valley floor and big high cliffs like bookmarks on either side. 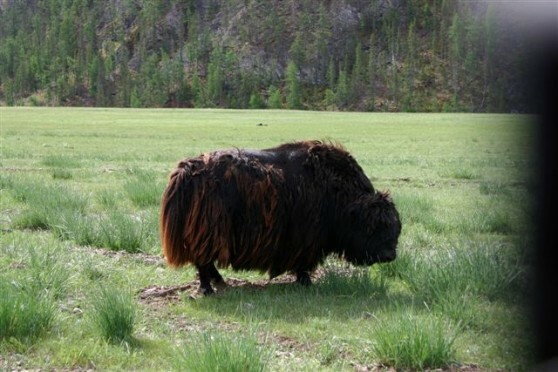 It's one of the nicest places I've seen in Mongolia and there wasn't a village for miles in any direction. We had the entire river to ourselves." 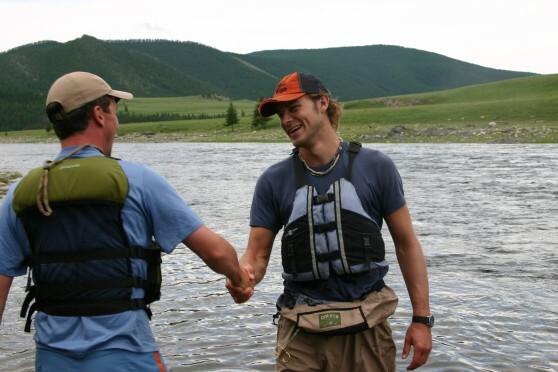 Nathan Ward, 2008 Fish Mongolia has been outfitting exceptional fly-fishing trips and camps in Mongolia since 2003. 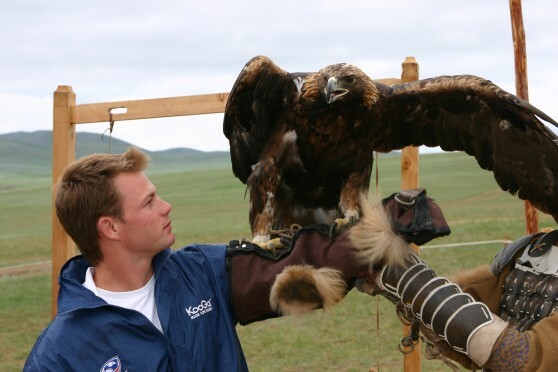 We are a fully licensed Mongolian fly-fishing outfitter and tour operator; with an international guide team including Mongolian, British and American fly-fishing guides. 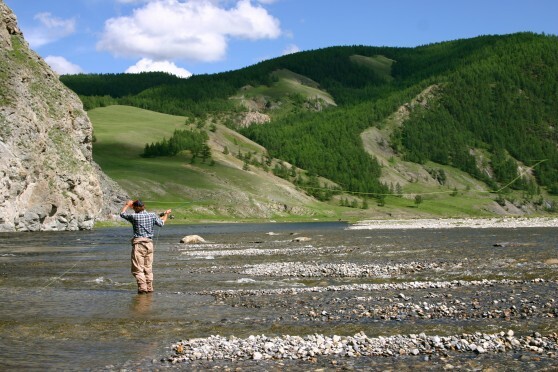 The Delger Muron float trip is our signature trip; we pioneered angling for Taimen on this dramatic mountain river and think it is perhaps Mongolia's Most Scenic Float Trip, offering outstanding fly-fishing for Taimen, Lenok Trout and Grayling on a week-long guided and fully outfitted trip. 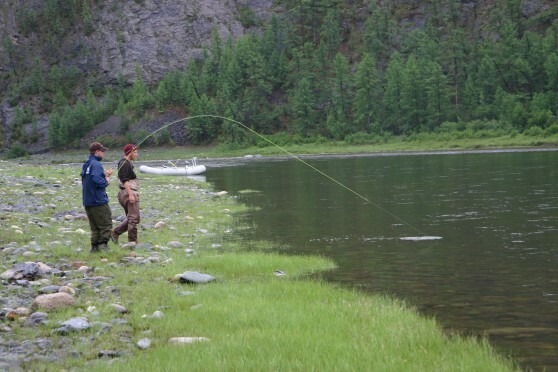 Perhaps Mongolia's best-kept fly-fishing secret, this is one of the most beautiful rivers in Mongolia; carved through limestone and granite bedrock, the valley is flanked by spectacular cliffs and rock pinnacles. 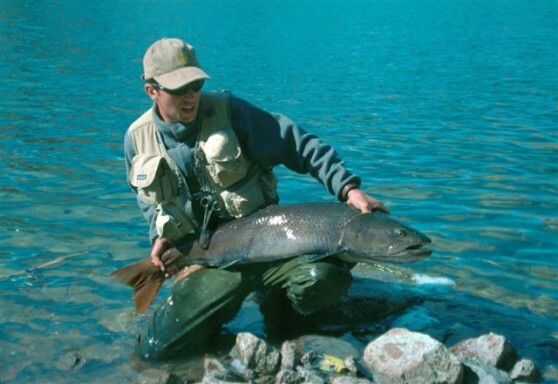 Even without the chance to catch a 50 inch Taimen the Delger Muron offers world-class trout fishing and scenery. 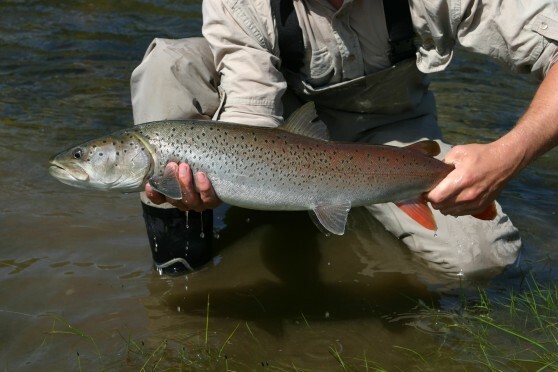 Remote and inaccessible sections of the river offer pristine and secluded angling with access only by raft, and have very healthy Taimen populations, with Taimen over 50 inches in many pools. 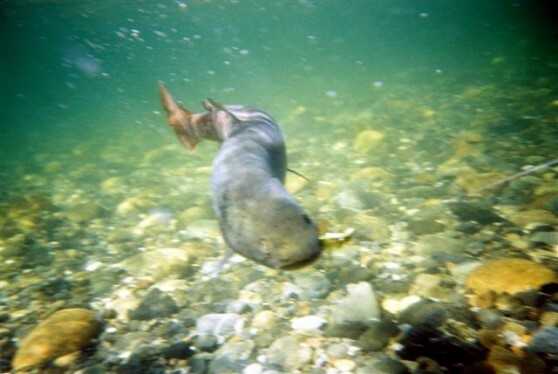 This freestone river also has abundant Lenok and Grayling, and it's not uncommon to encounter Taimen attacking a hooked Lenok. 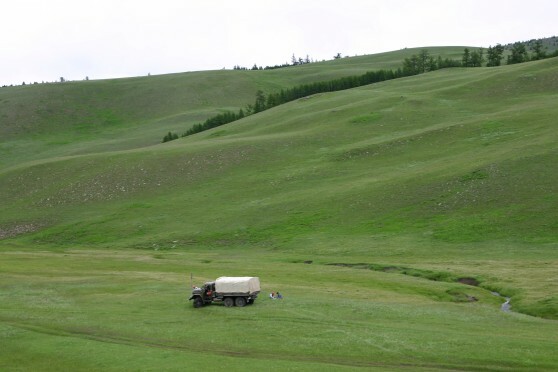 The put-in point on the Delger is reached by a one and a half hour flight from Ulaanbaatar followed by a four-hour cross-country drive. 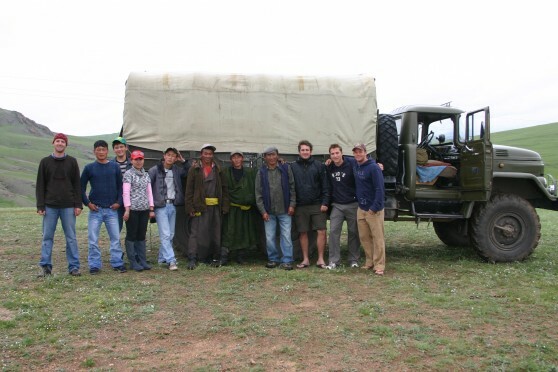 We know its not quite as convenient to get on the river as other helicopter-in camps closer to Ulaanbaatar, but we think that the river and the fishing is certainly worth going the "extra mile" to get there. 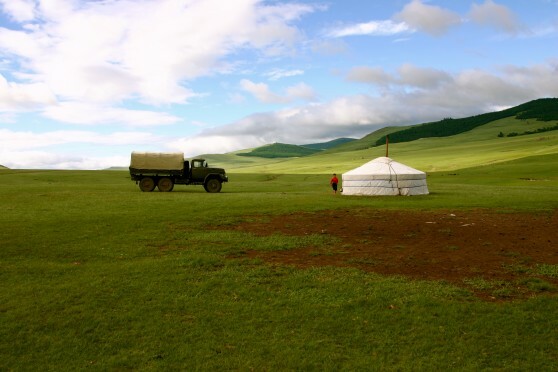 En route you will gain an appreciation for the vastness of the Mongolian steppe and the nomadic herders who inhabit this amazing landscape. 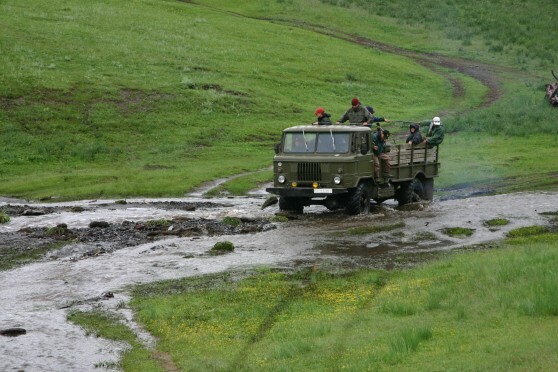 An added bonus is that you don't have to risk your neck flying in an ageing Russian Helicopter; domestic flights are operated by a reliable local company operating modern 30-seater Saab aircraft, and transfers on to camp are by Toyota Land-cruiser. those used on Western rivers in the US, served the purpose very well, carrying two anglers and a guide, in surprising comfort. 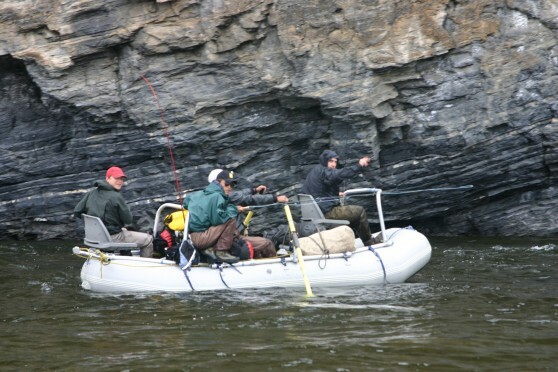 We fished from the boats as we drifted as well as stopping in promising pools and wade fishing." 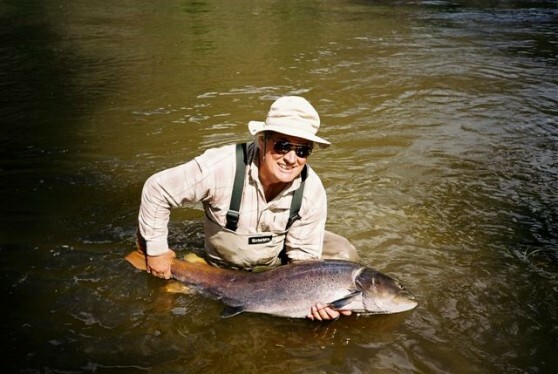 Tom Gorman, Global Angler 2005. 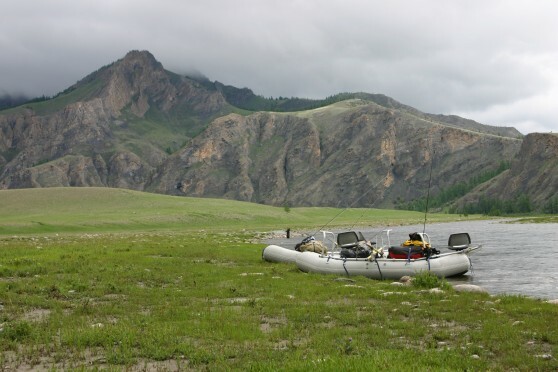 This is an unsupported float trip, everything we need for the week goes downriver with us, personal gear is stowed on your raft, while the crew raft brings the tents and supplies. 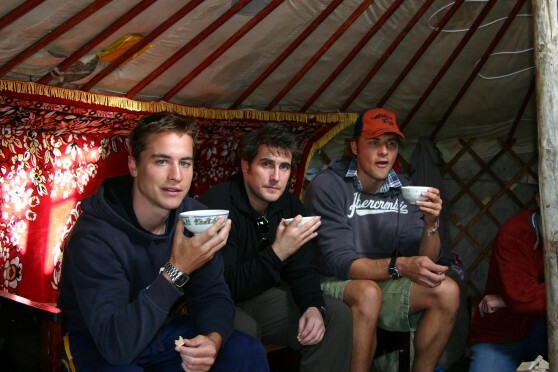 Camping is comfortable, with canvas tipi-tents equipped with low cot beds (twin occupancy), a large dining tent, camp chairs and tables, toilet tent and simple shower. 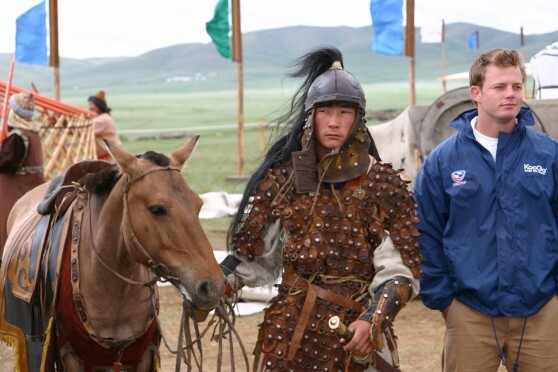 A base camp with gers (yurts) is set up at the put-in point, giving you a taste of Mongolian life and space to organize your gear at the beginning of the float. Each full-frame raft is equipped with front and rear casting seats and is rowed by one of our guides enabling you to fish drift-boat style from the raft. However, many of our guests prefer wading to fishing from a drift boat, so we have slowed down the pace of our float trips to give more wading opportunities; the emphasis is on the fishing not the floating, using rafts for pool-to-pool transport. This makes the trip suitable for fishing both double-handed and single-handed rods. A typical day begins with fresh brewed coffee around the campfire, followed by a hearty breakfast with muesli, eggs, bacon or ham, and pancakes; then its time to get the waders on, and stow your bag in the raft. The crew will take care of the tents and have them set up again at the next night's camp. You can simply walk down to the river and start fishing, or get in the boat and drift to the next prime pool; the guides know the water well and all have their favorite pools and runs to show you. Through the morning you will float to good pools then stop to wade and cover the water thoroughly. Your guides will often be up on the cliffs looking to spot taimen for you in the pools below. By lunchtime the crew raft will have caught up and will set up the fire pan on a gravel beach to grill the shore lunch of prime steaks or tasty kebab skewers. Then it's back to the boats to fish, drift and wade into the evening. Arriving at camp you will find your tents set up, with time for a cold beer and wash up before dinner. Hopefully you'll have some stories to tell around the campfire. 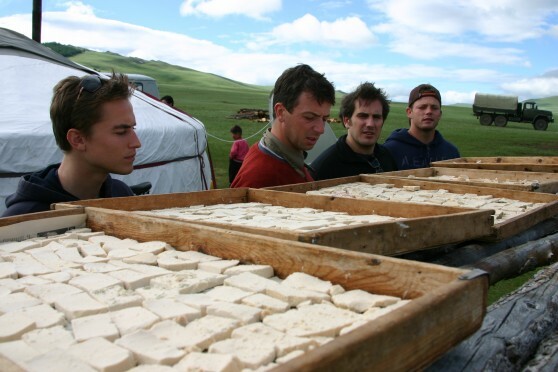 We think our expedition catering is among the best in country; marinated meat supplied by Ulaanbaatar's top gourmet caterers, along with fresh vegetables and fruit, is flown in weekly. Evening meals include roast pork loin, Dutch-oven lasagne, and pot-roast beef served with soups, salads, and desert, our peach cobbler and apple pie are a special treat. Beer, and red wine with dinner, is included in the trip cost; premium wines can be ordered in advance and delivered for your trip.